hello everyone!! for those of you who have heard on October 25th at the beacon theater their having an event for people who are into video games, there you can preview some of the games, which I listed below, meet and greet and other info surrounding those themes. the tickets range from 35-75 dollars and if you want more info i have posted the site where you can see for yourself. Hello everyone please take the time to rate and comment on this blog. So Bizzard is reworking the encounter with Onyxia. This will be released in patch 3.2.2 just in time for World of Warcraft’s fifth anniversary. Onyxia will have an updated loot table for the current game content. So far I have not heard anything about what loot will drop besides the flying mount the will be modeled after Onxyia. The mount will have an increased speed of 310%. Also the encounter will be updated to meet the current raiding style. Well this is a quick update from Kane take care. This information was taken from the Classes, Items and Professions Panel. You can go to http://www.blizzard.com/blizzcon/recaps/class_items_prof-panel.xml . For more information. This panel began by taking a close look at the two new playable races being introduced for World of Warcraft: Cataclysm. 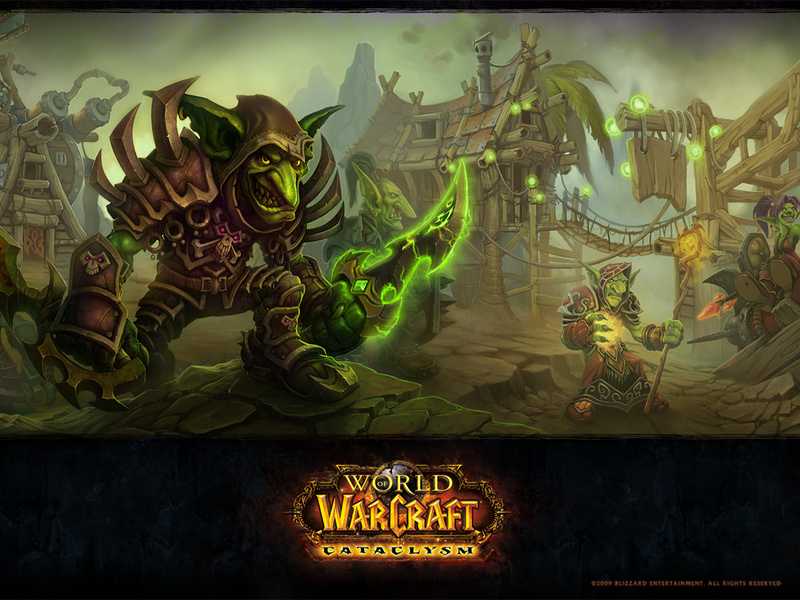 The goblin race, available to the Horde, will be able to choose from all classes except paladin and druid. Goblins also have some very interesting racial abilities, including a rocket belt that allows players to activate one of two rocket abilities every two minutes. The first ability enables the player to jump up to 20 yards, while the other shoots rockets at an enemy player within 30 yards. Additionally, every 30 minutes the goblin can summon a pack hobgoblin, which will act as a personal servant granting bank access. Goblins also gain a bonus to their alchemy skill, and should a player decide to become an alchemist there will be an increased benefit from drinking health and mana potions. Additional passive goblin racials include a permanent 1% increase to attack and casting speed, and because of their knack for mercantile affairs, goblins will always receive the best possible gold discount regardless of reputation. The worgen, our new Alliance race — has both a true form and a human form. The true form is purely cosmetic, and provides no combat bonus. A player may remain in either form when out of combat, but are automatically placed in their true form upon entering combat. Worgens have a racial ability called Darkflight, which allows the worgen to temporarily increase their movement speed by 70%, and can be used every three minutes. This activated ability, like entering combat, will also force the worgen into its true form. Other worgen racials include a passive 1% increase to all damage, reduced duration from the effects of curses and disease, and a bonus to skinning, as well as the ability to skin faster. Worgen will have access to all classes except paladin and shaman. Well the title says it all. 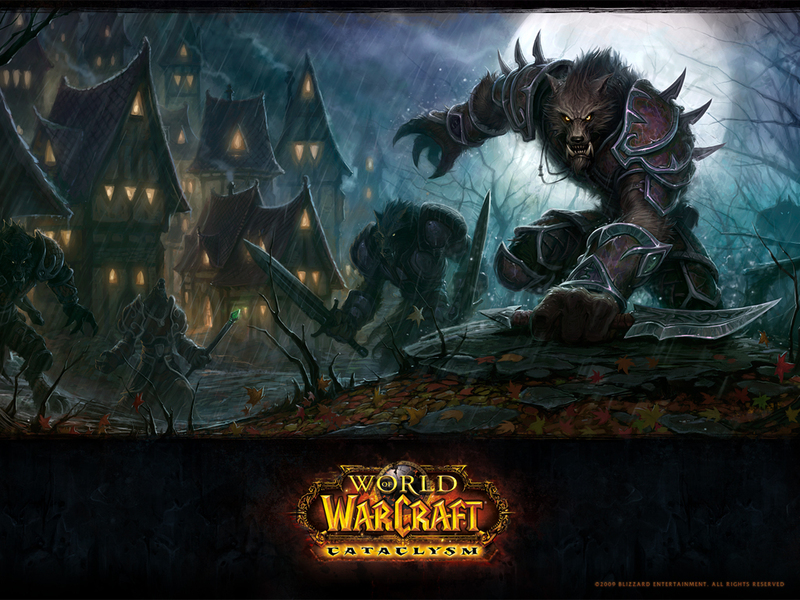 Cataclysm is the next expansion in World of Warcraft. So this expansion would make it number three. For those of you not follow Blizzcon this will be huge. Well actually you might not believe it. All of Azeroth will be changed. Old zones you have been in will be unrecognizable. But before that two new races are being released. One is called Worgen which is a werewolf race that once use to be human. Then you have the Goblins. This is going to be interesting. The level cap is being increased to 85. Also there will be new race class combinations. After the expansion goes live players will be able to fly in Azeroth. Also there will be several changes to stats and some new systems are implemented for guilds and leveling. I will be posting up some more detailed information the blizzard has released. So far the links that are up and are also being put on this post is Ubuntu and backtrack 3. If you would like to download these are any other linux distro I have up please click the download tab link or go to http://bluedragondistro.com/downloads . Please check the download page to see the rest of the linux distros you can download. I am proud to say that in a few days I will have download linkes setup for Ubuntu, Linux mint, and backtrack. BDD is like i said before an opensource project to make people more aware of linux and some of it’s basic applications. At the same time be able to give reviews also on Windows base applications and hardware. Please if you have any suggestions leave a comment I would be more then happy to hear from you. M.A.M. match four second K.O. Dale Luke’s first mix martial art match. Knocks out his oppenant in four seconds. Do I have to say more. If so watch the video.